So, until the White House, how do we fix broccoli here at the Martin house? Of course, broccoli with cheese is a classic. So much so that one year we grew broccoli and had the girls sprinkle grated cheddar around the plants as a fun and unique mulch! I also like to steam it and add a big splash of freshly squeezed lemon juice and big sprinkle of kosher salt. But perhaps my favorite way to prepare broccoli is to roast it. Using the Barefoot Contessa’s recipe as a guide, it’s easy to create what the Amateur Gourmet calls “the best broccoli of your life.” Perhaps even George H. W. Bush would like broccoli if he had it like this! The amounts don’t need to be exact – just eyeball it. Sometimes I omit the cheese, pine nuts, and basil, and it’s still good. Cut the broccoli florets from the thick stalks, leaving an inch or two of stalk attached to the florets, discarding the rest of the stalks. Cut the larger pieces through the base of the head with a small knife, pulling the florets apart. You should have about 8 cups of florets. 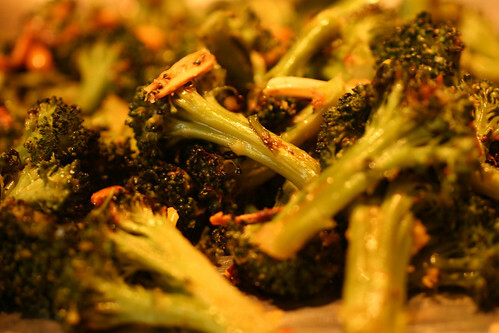 Place the broccoli florets on a sheet pan large enough to hold them in a single layer. (I use a half-sheet pan.) 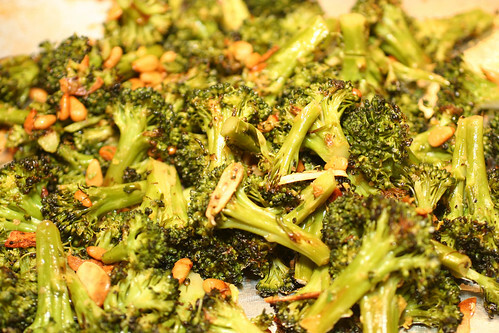 Toss the garlic on the broccoli and drizzle with 5 tablespoons olive oil. Sprinkle with the salt and pepper. Roast for 20 to 25 minutes (18 minutes in my oven), until crisp-tender and the tips of some of the florets are browned.